When I discussed the new drive meter in the Gridiron Solitaire post yesterday, there was one image I didn't mention: the tackle. We had a very solid lineup of images, but when a player played enough cards to stop the drive, we needed a tackle image as players collided. That sounds easy. Go into Google and find a photograph of a tackle that you like, then use the general positions of the players and creat an image. Amazingly, though, I couldn't find one. It's very hard to get a tackle at just the right angle, particularly for the purposes of the game. I had no problem buying the rights to an image, because Fredrik is working on the images for the opening cut scene and I didn't want to reinvent the wheel, but I couldn't find a suitable illustration, either. I spent hours combing through images yesterday, utterly failing, and then I realized that I had a copy of the best skeletal animation system ever used in a sports game: Backbreaker. 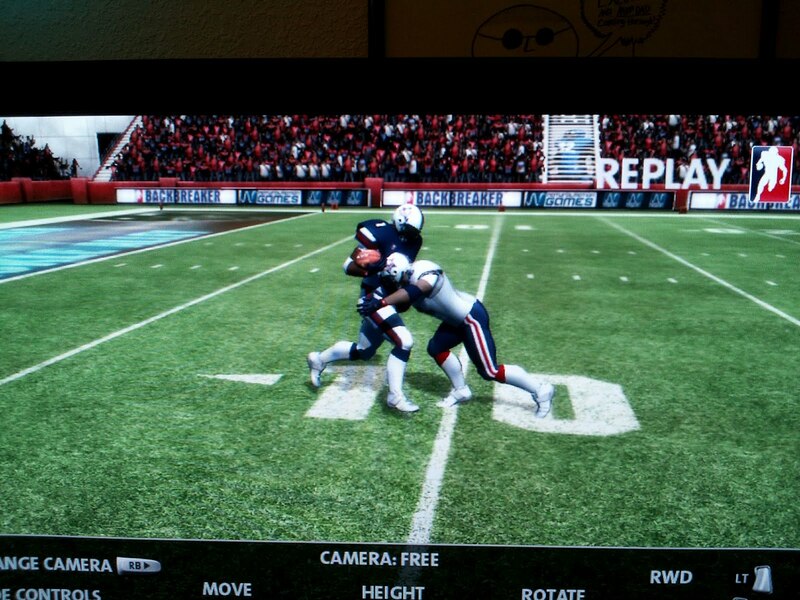 Incredibly, given that it was relesaed in 2010, Backbreaker's animation system is still (and I'm not exaggerating) light years ahead of Madden. It's embarrassing (or it should be to be EA) that a game created with a tiny team has animation totally superior to the flagship franchise of a multi-billion dollar corporation. 1. The two-minute A.I. was very poor. 3. Receivers had this strange behavior when catching certain passes. These things were never patched, which was sad, because what they fixed in the first patch was far more difficult than fixing these things. However, Backbreaker had an incredible dynamic animation system, and the tackle animations, in particular, were unparalleled. 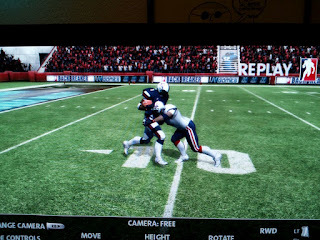 I realized that all I needed to do was go into Backbreaker, play the mini-game called Tackle Alley (so that there would only be a few players on the field), then use instant replay to go frame-by-frame until I found the right pose for the game. We're going to wind up with about 4 different poses, and I'll be able to use a different pose depending on how many plays were left in the drive when it was stopped. 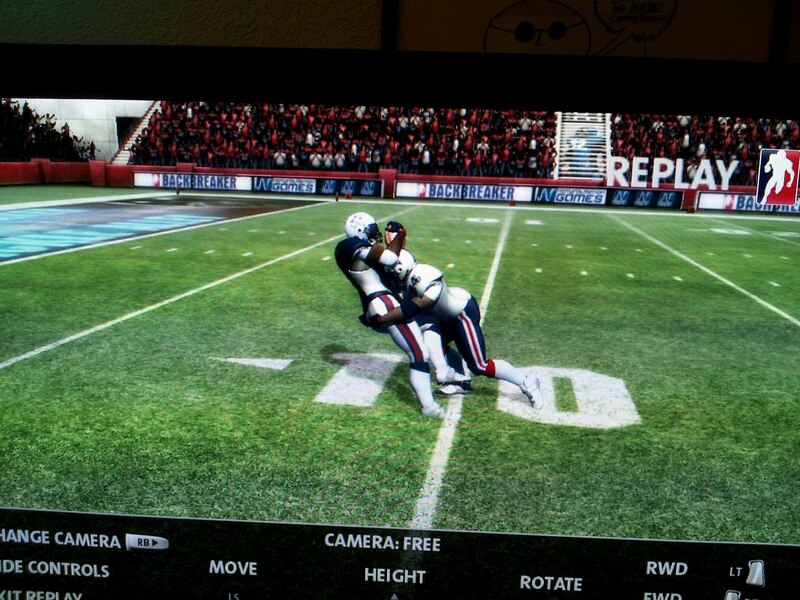 Seeing Backbreaker in motion again makes me think that I may wind up playing a full season this fall. I miss playing football games, but NCAA is a joke at this point, and Madden hasn't been any better the last two years. I think it would be easier to live with Backbreaker's issues--and enjoy the things it does spectacularly well--than live with Madden's continued weakness.